An exciting new partnership between the U.S. Geological Survey (USGS) and the Yukon River Inter-Tribal Watershed Council (YRITWC) is yielding critical data for the assessment of climate change effects in the Yukon River Basin. The foundation of this partnership is a shared interest in the current and future water quality of the Yukon River and its relation to climate. The USGS began a landmark study of the Yukon River and its major tributaries in 2000. A key objective of this study is to establish a baseline dataset of water quality, which will serve as an important frame of reference to assess future changes in the basin that may result from a warmer climate. 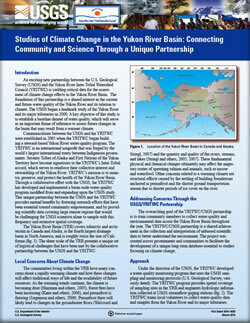 Schuster, P.F., and Maracle, K.B., 2010, Studies of climate change in the Yukon River Basin—Connecting community and science through a unique partnership: U.S. Geological Survey Fact Sheet 2010-3020, 4 p.